MAHINDRA'S underrated forward Aldrech Ramos shot his way out of much-heralded teammate Nino 'KG' Canaleta's shadow, smoking the Alaska Aces defense last week, and beat out other sweet shooters like TNT's Jayson Castro and SMB's Marcio Lassiter to notch his first ever PBA Player of the Week award. Scoreless in the first half, the 6-foot-5 Ramos caught fire in the last two quarters, pouring all 25 of his points on a red-hot 11-of-15 shooting to lead Mahindra to a shock 102-94 win against Alaska. The Enforcers' stretch-four was at his absolute best in the final period, knocking down 16 points to quell the Aces’ endgame rally, and securing Mahindra’s fourth win in eight starts. Ramos, a former Smart-Gilas backup big man, also hauled down seven rebounds and added one assist to earn the Accel-PBA Press Corps Player of the Week nod for the period of March 22-27, besting Castro, Lassiter, and NLEX ageless slotman Asi Taulava for the honor. 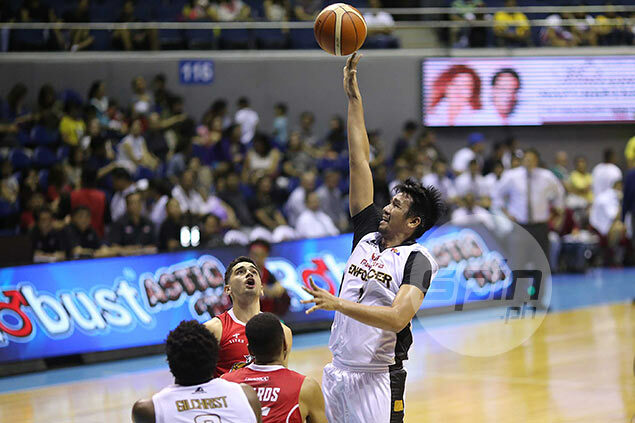 “Sabi ni coach na laruin ko lang yung game ko,” said the soft-spoken Mahindra forward, who was one point shy of tying his season-high 26 points, which he registered on February 20 in a 102-96 win against San Miguel Beer early in the PBA Commissioner’s Cup. “Si coach naman marunong mag-mix up ng minutes ng players. Eh natiyempuhan lang na maganda game ko kaya nag-stay ako ng matagal,” he added. Mahindra, currently at joint fifth place with three other teams, shoots for its fifth win and inch closer to the franchise’s first-ever playoff berth when it clashes with league-leader Meralco on Sunday.